Inspired and guided by Swami Dayananda, Sheela Balaji is deeply committed to the community and social development projects he has initiated. Currently she is the Managing Trustee and Secretary of the All India Movement for Seva, Swami Dayananda Educational Trust, Arsha Vidya Research and Publication Trust. Satabhisekam, the passage of one thousand full moons, is a significant milestone, in the journey of a person’s life, according to Vedic culture. When it is of a most revered and respected person. The occasion demands an offering befitting the person’s stature. Towering above in intellect and wisdom as Swami Dayananda Saraswati does, it is an onerous task and with hesitation one embarks on such an endeavour. His contributions to Vedanta and Vedic Dharma, Significant as they are, need to be recorded and adequately presented. The satabhisekam of the extraordinary thinker and spiritual leader of our times affords an appropriate occasion to do so. It is sincerely hoped that the words and works may inspire those who are already on the path or debating to enter, encouraging adherents of dharma and seeker alike. 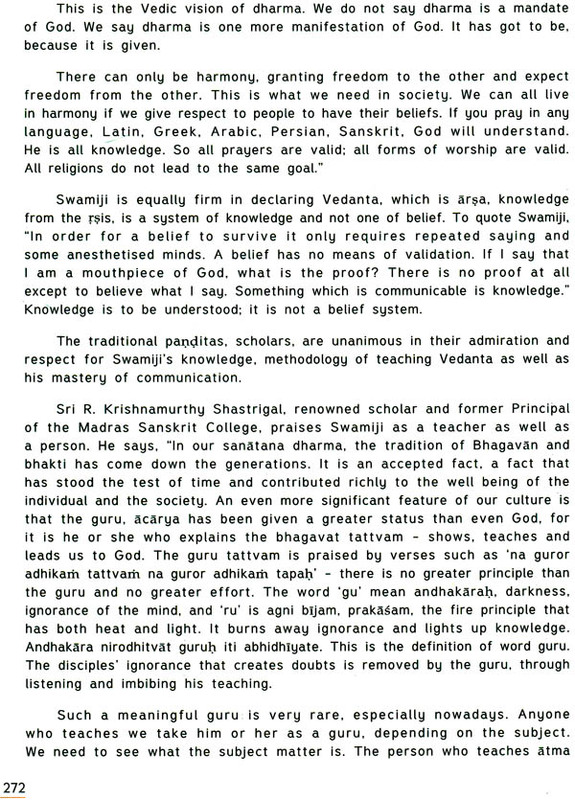 There has been no serious attempt to record Swamiji’s contribution to the teaching tradition and Vedic Dharma after 1990. The earlier volume, published on the occasion of the sixtieth birthday, his life from the Manjakkudi days through the years in the Chinmaya Mission to the Arsha Vidya period, 1930 to 1990. It dwelt at length on Swami Dayananda as a theacher of Vedanta and his teaching methodology. In particular on the Teaching Tradition of Advaita Vedanta brought out his pedagogic skills. The volume concluded with the performance of the bhumi puja for the gurukulam at Anaikatti. The satabhisekam commemorative volume attempts to present the versatile person that Swami Dayananda is contributions from 1990 to 2011, writings, conversation, and interactions. Opening with a description of the gurukulam at Anaikatti, we see through the students’ eyes the life in an ashram and Swamiji’s thoughtful concern for their welfare. The major initiatives, inter religious dialogues and seva programs follow in quick succession to conclude with the satabhisekam celebrations at Saylorsburg. They help to understand Swamiji’s thought processes and how he accomplishes his objectives. The articles and editorials, 1957 to 2000, trace his journey through words. It provides another dimension of Swamiji’s personality, the literary dimension. Through the conversations, Swamiji shares his views on sastra, astrology, dharma, psychology and the role of a teacher, a guru. In the concluding chapter, we see Swamiji through his interactions, assuming different roles, coming across as very human, very approachable. The events, initiatives, achievements and writings, uniformly point in one direction, the inherent strength of the Vedic Dharma and its universal vision which is Vedanta. It has uniqueness of vision and culture that are integral to it, which need to be emphasised. Those who understand the profundity and all encompassing view of this dharma, realise the there is no other that can compare in its breadth of Vision. Welcoming every aspect of creation, the Vedic tradition, which is also a religious culture, looks upon it as a manifestation of Isvara. There is nothing but Isvara. To use Swamiji’s world, “Dharma is not a mandate of God. It is a manifestation of God. Dharma is Isvara. If it is properly interpreted, life becomes objective, yoga. One can be a beneficiary without destroying others. 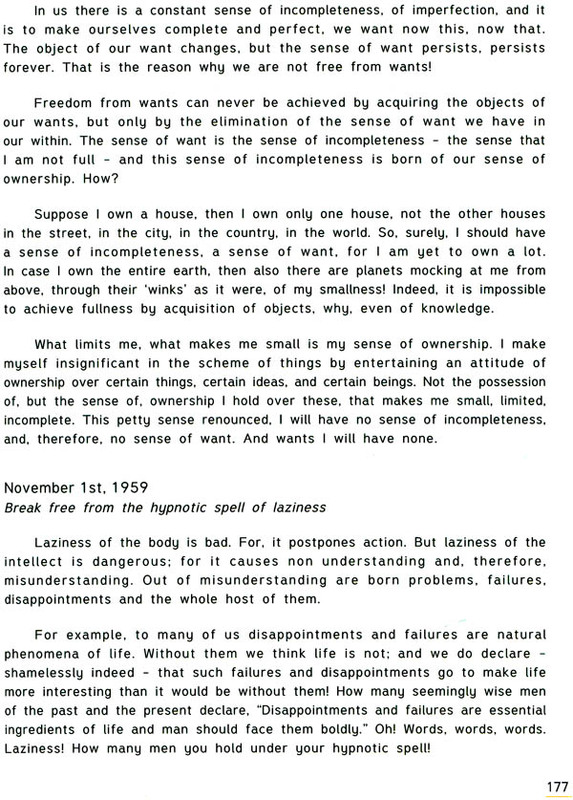 “He concludes, “The more you conform to dharma. The more successful you are in life. 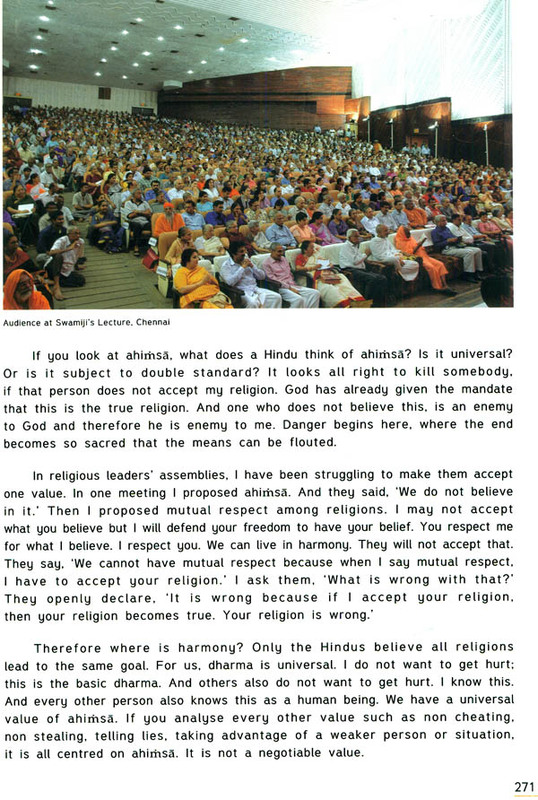 It is not an advice; it is a way of life.” Consequently, there is not the least need for religious conversion, for disturbance of any kind, for everything is the critical relevance and strength of Vedic Dharma, an essential component for global peace and harmony. Over the years, the value and content have not been adequately appreciated, enveloped by miasma of misinterpreted concepts and less understood principles of the dharma. It is more due to lack of understanding, as education of the dharma and its vision has not received the attention deserves. A profound culture requires to be projected. It also needs propagation. Since this involves time and resources, the need of the moment is to protect it from aggressive religious traditions. It means religious conversion programs have to be firmly objected to and checked, because not only do they disturb, but they hurt people as well. Swamiji says that the core person is the religious person, and when that person is hurt, it becomes a source of tension and conflict. Committed to ahimsa, he is pained by violence, irrespective of who the person is or what his or her calling. It is unacceptable in any form, by any person. The Vedic culture is a treasure bequeathed to humanity that has survived centuries of depredation with difficulty. Swamiji calls it a battle scarred warrior of a civilisation. The mere fact that Vedic Dharma continues, despite the years of unfortunate experiences. Testifies to its innate value and relevance. Swamiji’s efforts therefore are towards creating awareness of its universal significance. He believes that such appreciation would develop self assurance in individuals, communities and in a nation. Swamiji’s anthem for seva sings of the well being of Bharat, its prosperity, its glory; Bharat that is praised by great minds of sages like Bharata. His concern for the Vedic vision flows to its culture, to the individual who is the basic building block of a nation. He remarks, “We are into people making. We work with minds.” From minds, we can extrapolate to individuals, to families and beyond. Swamiji’s focus and major activity until 1999, has been teaching Vedanta in classes at the gurukulams and public talks. That year, the floodgates open as it were and spurt of activities inundates his life as a teacher. The location, purpose, people and topics vary, but the objective remains constant, strengthening Vedic Dharma, creating awareness of one’s tradition for each person to be who he or she is Programs are developed to equip tradition to suit Contemporary communication and practices. Supports and encourages the many aspects of life that constitute culture, such as music, dance and other art forms, crafts, temple architecture, and much more. With this view in mind, he has initiated dialogues, conferences and programs in India and other countries, such as the UN Millennium peace Summit. His contribution of providing a unified voice for Hindu Dharma through the Acharya Sabha is a historic achievement. And the conception of a grass root level caring programs, the All India Movement (AIM) for Seva, reaching to all people irrespective of their social and cultural background, is Swamiji’s another unique accomplishment. 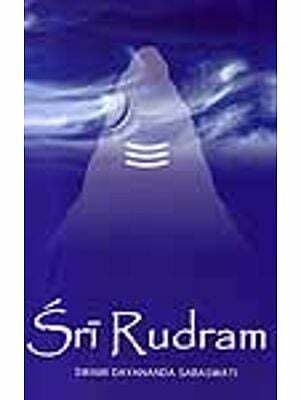 Significant though his efforts towards dharma and seva are, he prefers to call himself, simply, a teacher of Vedanta. In that, he is certainly the rarest of his kind, for his communication is precise and true to the nature of the self, the truth that teaches. He does not resort to hyperbole nor does he mystify. His teaching is precise and direct, as makes us understand that none but the self, Brahman. exists. The division of subject object melt. Only awareness remains. At times, when I hear teach, I seem to hear, clearly, the message of the mystic School. On other occasions when he dwells on the nature and methodology of teaching, the use of negation, thoughts of another philosophic tradition run through. Above all, I hear Vedantic vision, which he brings to life. His understanding of Sankara is such that any scholar, academic or pandita, will vouch for his traditionalism. He continues the pure tradition, without bifurcating it into theory and practice. When I had a chance, I had to ask him if he combined all the three. His reply was unambiguous. He said, “This is the Vedantic tradition. It includes every tradition. 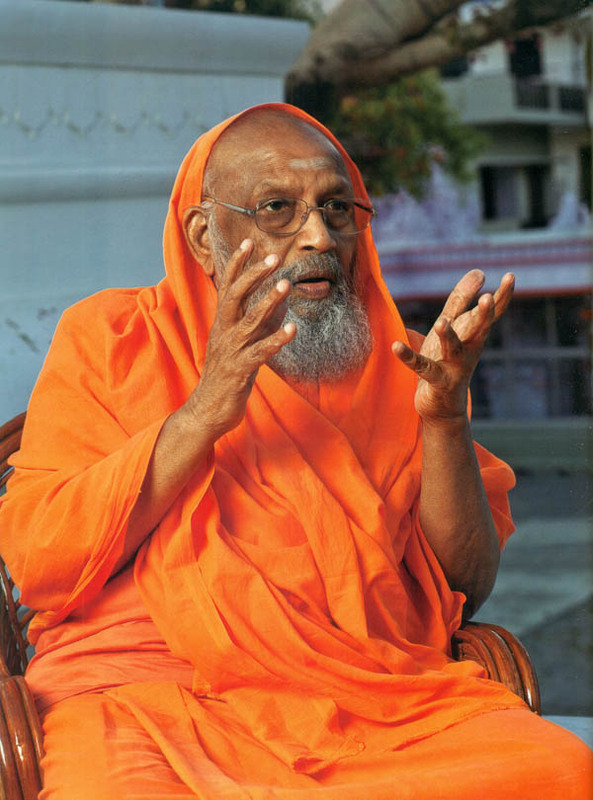 Swami Dayananda Saraswati, G. Natarajan, was born in 1930 at Manjakkudi, a small village on the Kaveri delta, near Kumbakonam, Tamilnadu. After completing his basic education, he went to Chennai in search of employment. Thereafter, in 1953, a meeting with Swami Chinmayanandaji inspired him to take to a life of seva, study of Vedanta and Sanskrit. The following years were dedicated to understanding the content and vision of Vedanta, which brought out fundamental issues that required further guidance and learning. In 1961, with Swami Chinmayanandaji’s permission, Brahmacari G. Natarajan went to study with Swami Pranavanandaji at Gudivada. Frequent visits to meet Swami Pranavanandaji, spending more than a month at a time with him at satsangas, helped him understand that Upanisads were pramana, means of knowledge to know the truth of the Self. This impelled him to study once more the sastra, with Sankara’s commentaries, gaining insights that transformed his thinking and outlook. It was a critical shift in vision, one that would have significant consequences. On Mahasivaratri day, 4th March 1962, he was ordained as Swami Dayananda Saraswati by Swami Chinmayanandaji in Chennai. 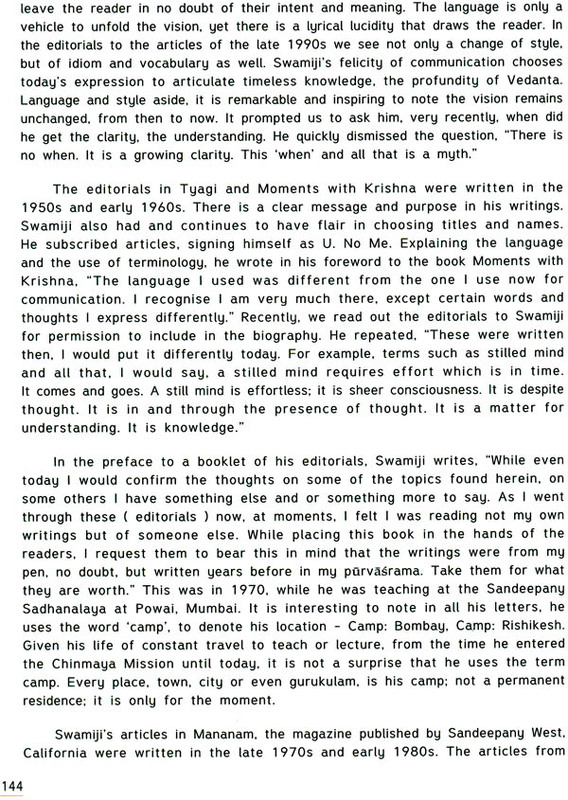 A short retreat later at the Tapovan Kutir in Madurai, Swami Dayananda went to Mumbai, to the newly inaugurated Sandeepany Sadhanalaya, where he was given the responsibility of editing the Mission’s magazine Tapovan Prasad, while Sri Swamiji conducted the residential Vedanta course. Although Swami Dayananda was not involved in the course, he used to teach chanting of the Gita, Taittriya Upanisad and other verses including the guru stotram, akhanda mandalakaram, verses selected from the Guru Gita. Later, in early November 1963, with his guru’s blessings, Swamiji left for Rishikesh where he studied Brahmasutra bhasyam with Swami Taranandaji at the Kailash Ashram. Swami Pranavanandaji’s inputs, studying the Brahmasutra with Swami Taranandaji and Swamiji’s own efforts, together brought about a cange in his understading of Vedanta and him forge a different direction in his teaching methodology. 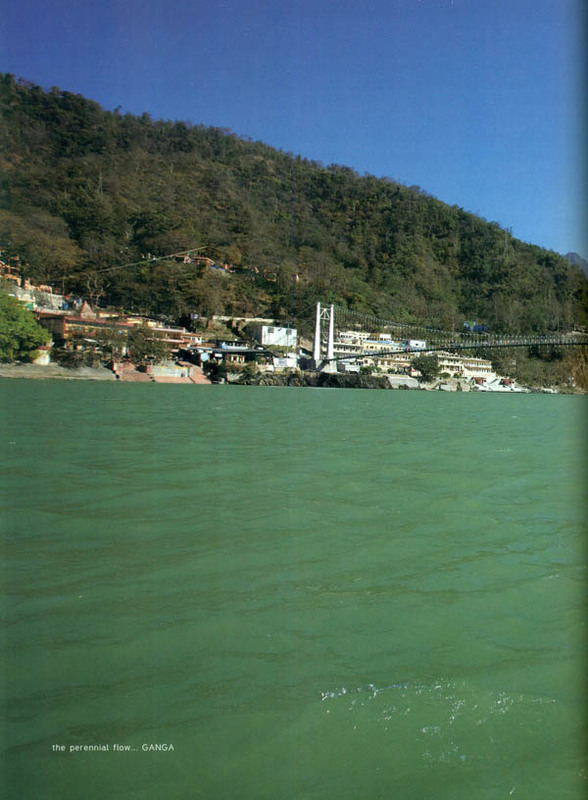 At Rishikesh, Swamiji stayed at the Andhra Ashram, exploring the Himalayan towns. He found a place on the banks of the Ganga whichwould later become his ashram. A simple grass hut built on this piece of land was to be Swamiji’s home for the next few years. Living in this hut with Spartan comforts, the period 1964 to 1967, were years of study and teaching. Later, as he drew more students and devotees through his classes and travels, the grass hut gave way to a brick building, became the large ashram it is today. Enjoying the freedom of the mountains and a lifestyle eminently suited for contemplation and studay, Swami Dayananda had no thought of moving out of contemplation and study, Swami Dayananda had no thought of moving out of at any time, when he heard that his guru would be at prayag Kumbhamela. 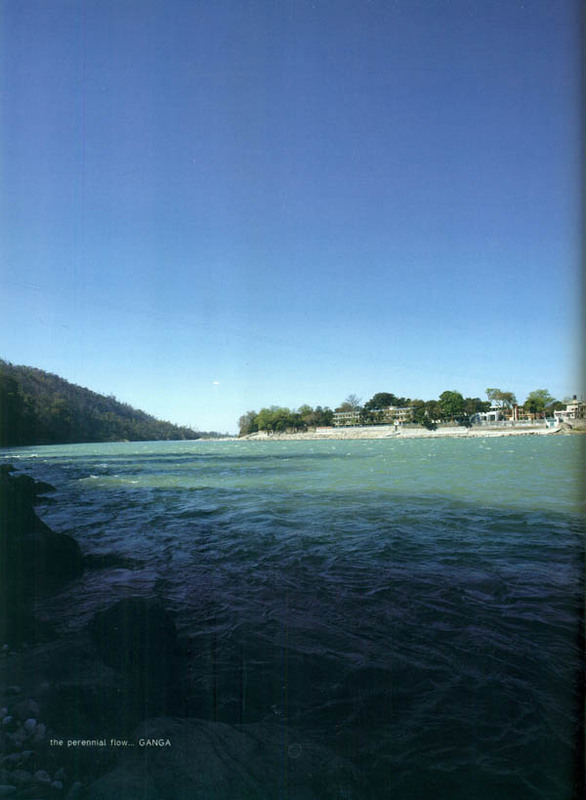 He travelled to Prayag to meet Swami Chinmayanandaji to inform him that he had completed the studies of the Brahmasutra. 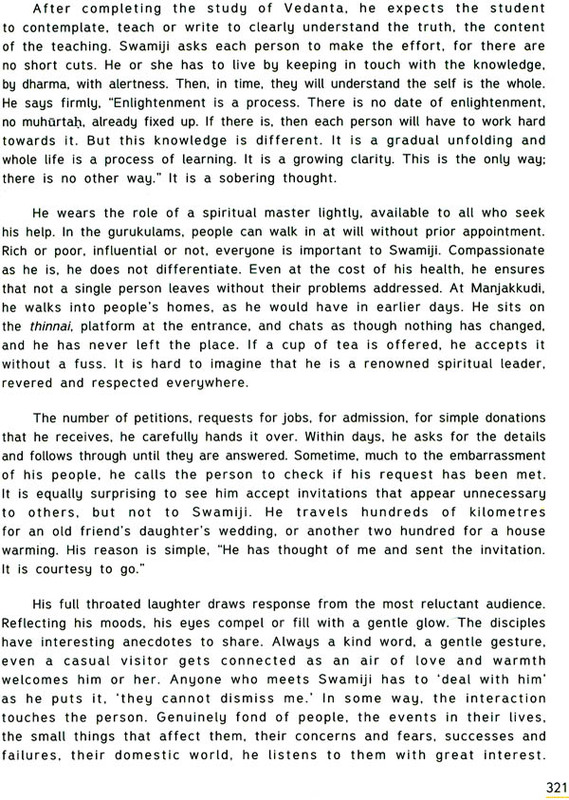 A few years later, Sri Swamiji’s ill heath necessitated assistance in teaching as well as for the Mission work. Sri Gopalakrishna Reddy, secretary of the Chinmaya Mission at Chennai, suggested that Swami Dayananda could be persuaded to resume public talks and lectures. 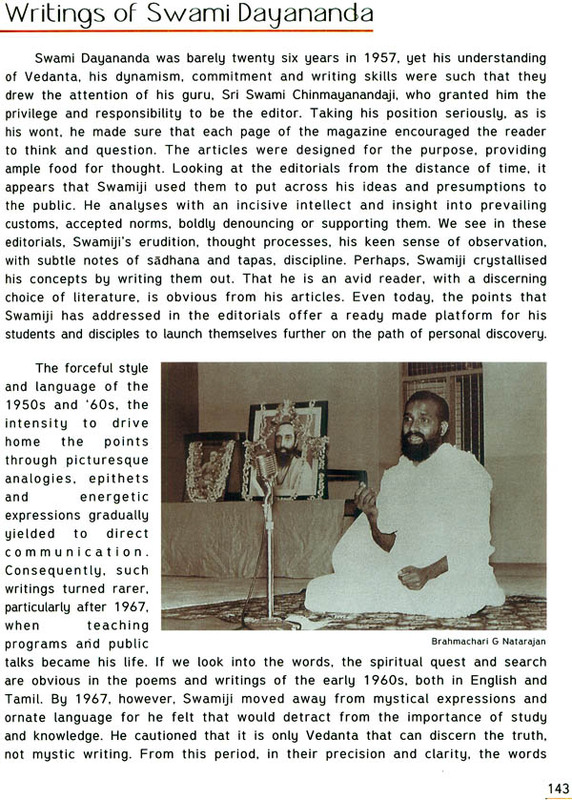 Responding to the invitation, between 1967 and 1970, Swami Dayananda began travelling to different towns and cities in India, spreading the message of the Gita and the Upanisads, but returned to Rishikesh between lectures.